Wilde’s Solicitors Limited are committed to protecting and respecting your privacy. In this policy, we, us and our refers to Wilde’s Solicitors Limited, a limited liability company registered in England with company registration number 07204878 and is authorised and regulated by the Solicitors Regulation Authority. The registered office is at 6 Bridge Street Neston Cheshire CH64 9UJ. Wilde's Solicitors Limited do not use your personal data for marketing purposes and we do not sell on your personal data. The information we collect on you is relevant to the legal services we provide on your behalf. We do not carry out profiling from the personal data you pass to us. •	Information supplied to us by third parties. •	other details specific to you and your matter. 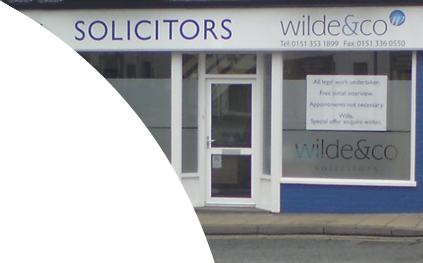 •	via e-mail; other written correspondence; telephone calls; web based forms when you fill in forms on our internet website www.wildesolicitors.com or other means. It includes information you provide when you contract or intend to contract with us to provide a service or search for a service. You might also give us personal data when you participate in meetings, conferences with third parties (for instance Counsel), seminars or other events we arrange. Sensitive personal data We do not generally seek to collect sensitive personal data. If we do collect sensitive personal data, we will ask for your explicit consent to our proposed use of that information at the time of collection. We gather this information to allow us to provide the services requested. The relevant information is then used by us to communicate with you on any matter relating to the conduct of your instructions in general. If you agree, we may also contact you about other products and services we think may be of interest to you. We may also use aggregate information and statistics for the purposes of monitoring website usage in order to help us to develop our website and our services. We may also provide such aggregate information to third parties. These statistics will not include information that can be used to identify you. To conduct appropriate checks (including anti-money laundering compliances) and all processing which is necessary for us to comply with our professional, legal and regulatory obligations. To perform our contract with you and/or to take steps at your request before entering into a contract. To comply with our legal and regulatory obligations. To maintain up-to-date client records. To perform our contract with you and/or to take steps at your request before entering into a contract. To comply with our legal and regulatory obligations. External audits and quality checks, e.g. for the audit of our accounts, Lexcel and other accreditations. It is in our legitimate interests to maintain our accreditations. To comply with our legal and regulatory obligations. •	where the processing is necessary for reasons of substantial public interest, in accordance with applicable law. •	Our partners, staff and consultants based in the United Kingdom. •	To other professional advisers (e.g. barristers) and third parties in accordance with your instructions. •	Debt Collection and Tracing Agents. •	Our insurers, brokers, auditors or risk managers as may be reasonably necessary for the purposes of obtaining or maintaining insurance, managing risk, or the establishment, exercise, defence of legal claim. •	Third parties who provide services to us (e.g. IT services). •	A purchaser in circumstances where we or substantially all of our assets are acquired by a third party, in which case personal data held by us will be one of the transferred assets. o	to assist us in improving our products and services. All information you provide to us is stored on our secure server in the UK or in hard copy form in the relevant paper files. •	to protect your vital interests or the vital interests of other person(s). •	so that we may address any queries or other issues relating to the work we have undertaken. Service	- ‘Cloudflare’	Cloudflare is a website performance and security optimisation platform. Purpose - This cookie is used to identify individual clients behind a shared IP address and apply security settings on a per-client basis. It does not contain any personally identifiable information. Your Consent By submitting your personal information you consent to the issue of the use of that information as set out in this policy. Consent on this occasion will extend to all future matters which we conduct on your behalf.